Colin Spoelman and David Haskell, The Kings County Distillery Guide to Urban Moonshining: How to Make and Drink Whiskey, (New York: Abrams, 2013), 224 pages, $24.95. Colin Spoelman is the Master Distiller of Kings County Distillery and co-author of The Kings County Distillery Guide to Urban Moonshining: How to Make and Drink Whiskey. Spoelman grew up in the dry Harlan County of eastern Kentucky. While the region had a long history of moonshining, Spoelman didn't try it for himself until he moved to New York. While Spoelman worked in film, architecture and perfume, Kings County Distillery grew from an idea, to a hobby to a full time business that has earned a good deal of commercial and critical success. Like other recent books on food and drinks, the cover art is printed directly on the binding which avoids the customary dust jacket. But unlike other recent books, the art and text are printed onto a cloth binding which gives it a wonderful texture. The interior of the book is equally striking with bold red highlights, diagrams and chapter breaks. Spoelman and Haskell pack quite a bit of information in the book's slim 224 page frame. It is organized very well and covers just about everything you would want from a book of this sort. It includes the basics of what makes whiskey unique, its history, a survey of the large Kentucky distilleries and some notable Craft distillers, how to make on a small scale, as well as whiskey recipes. Despite this breadth, The Kings County Distillery Guide to Urban Moonshining is like a welterweight prizefighter – zero fat and packs a punch. My two favorite sections of the book are “A History of Whiskey,” and “How to Make Whiskey.” As a student of history I appreciated the fact that the book's history chapter didn't repeat the the same old tired stories about Kentucky. Spoelman and Haskell included great stories about the history of distilling in New York and the mid-Atlantic states that have an equal claim on the history of whiskey in the US. Spoelman's chapter on how to make whiskey is clear and easy to follow. For anyone who has home-brewed a batch of all grain beer will recognize many of the steps involved in mashing and fermenting the distiller's beer. The description of the distilling phase has through instructions that demystify the process. The one question that repeatedly came to mind while reading the book was, how can Spoelman tell his story and not get into legal trouble. Spoelman and Haskell are clear about the illegality of home distilling but its unclear why they or other moonshiners-turned-distillers can publicize their stories without legal consequence. There are a number of possibilities that float around in my head but since I am not a legal scholar it is probably prudent not to speculate. 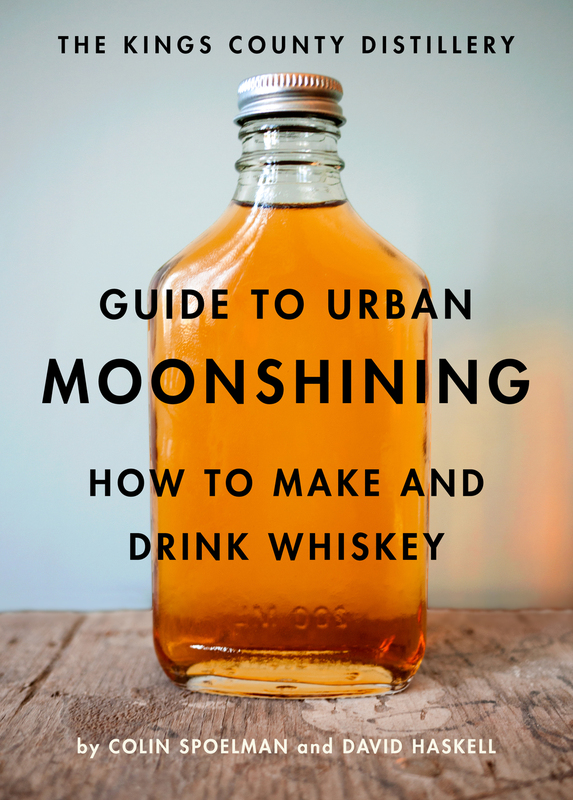 The Kings County Distillery Guide to Urban Moonshining, would make a great addition for a wide variety of readers. Fans of Kings County Distillery, the homebrewer interested in adding a new hobby, or the whiskey enthusiasts who wants to better understand the process of distillation will likely find the book useful and educational. Spoelman and Haskell have produced a great book and I would be glad to see them collaborate on another.